The IRMA 858 near infrared (NIR) moisture analyzer is MoistTech’s fast at-line moisture testing sensor. The 858 incorporates MoistTech’s well-proven IR-3000 moisture sensor optics and electronics providing superb accuracy, resolution and the shortest test time of any similar technology gauge. Unsurpassed in performance, stability, reliability, maintainability and cost of ownership the IRMA 858 is the answer to controlling moisture in your product. Ideal for laboratories or near processing lines MoistTech’s IRMA 858 infrared moisture gauge is the first sensor where samples are measured from the bottom up in sealed, quartz based containers. With samples in a completely sealed chamber eliminates any constituent losses that are caused by handling and in the environment providing the most accurate true moisture reading. With results that are obtained in less than 1 second you will dramatically improve product quality, providing both energy savings and potential increased productivity with lower material losses. Additionally, it has a one-time calibration, maintenance free, drift free optical design that allows operating personnel to confidently make immediate process adjustments based on real-time measurements. 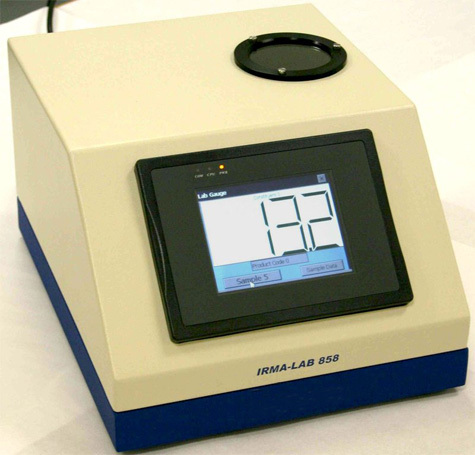 The IRMA 858 infrared moisture tester incorporates a large color touch-screen PC with a detailed operator screen that provides time and date of sample, process location of sample and operator name. Calibration software is also built-in with regression analysis and storage of calibration data. MoistTech has the worldwide reputation for its exceptionally accurate NIR (near infrared) sensors and software for moisture testing, measurement and control, the newly developed IRMA 858 infrared moisture analyzer and software can be configured and calibrated for numerous components in virtually any application. You will find links to typical moisture sensor applications where MoistTech’s products are ideally suited for accurate and precise moisture testing, measurement and control. In addition, thousands of infrared moisture analyzers are installed on MoistTech applications, not only for the measurement of moisture, but also for other applications, such as measuring and controlling: coating thickness, resin content, oil, protein, fat, nicotine, sugar, seasonings, plastic film thickness and many other constituents. Options for the IRMA 858 infrared moisture gauge include remote mouse and keyboard, as well as proprietary network support for Profibus, DeviceNet and ProfiNet.